There’s nothing like experiencing the darkness of the polar night for the first time. Winter in Tromso is one of the places where you can view it. During the height of daylight, the sun blazes just over the horizon, scattering the sky with hues of pink and gold before sinking back below. On the darkest days of the year, the whole spectacle lasts less than an hour. Luckily, there are plenty of things to do in Tromso, Norway in the wintertime that don’t require full daylight. 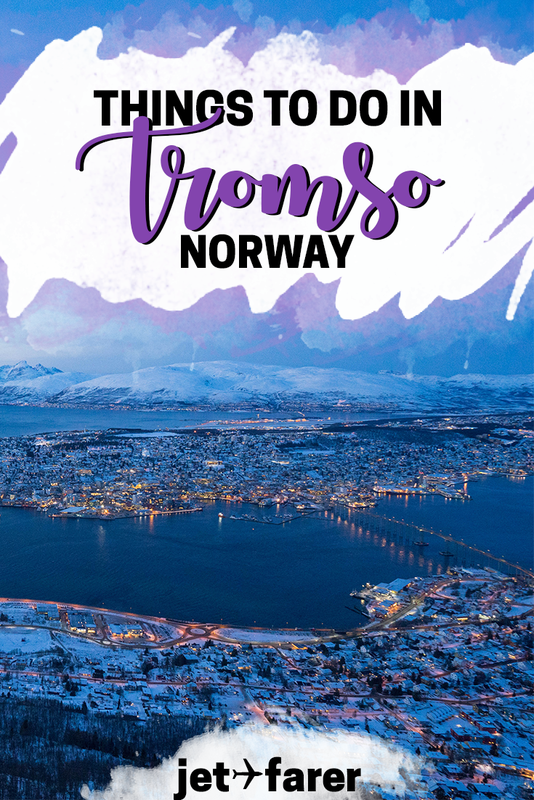 If you’re looking for a winter destination that combines incredible nature experiences, beautiful landscapes, amazing food, and a charming city, Tromso is surprisingly the perfect place. Many visitors come here specifically to see the northern lights, but there are so many other things to do in Tromso, especially in the wintertime. About a 2 hour flight from Oslo, Tromso (Tromsø in Norwegian) is one of the northernmost cities in Norway and has been coined the “Paris of the North.” Although it doesn’t have much in common with the City of Lights, it is a spectacularly beautiful city, located in a dazzling fjord and surrounded by snowy mountaintops. 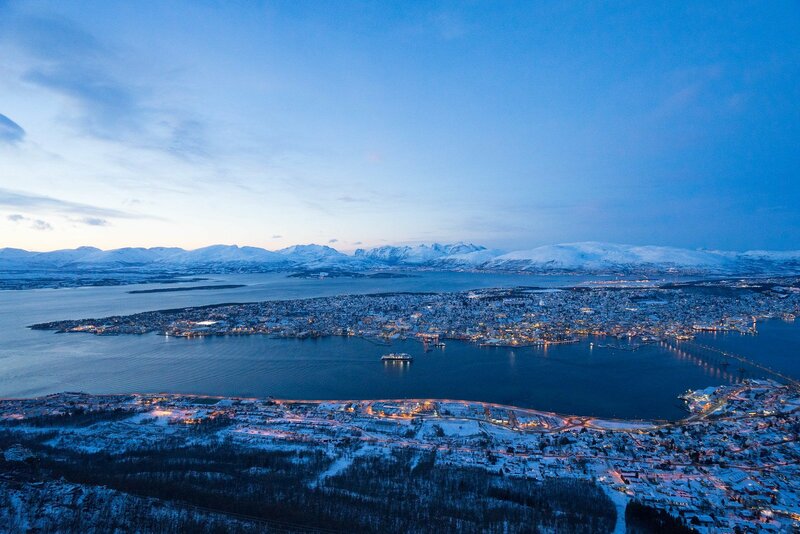 Tromso is the gateway to the Arctic Circle, and it’s an experience worth having at least once in your life. Among the most obvious things to do in Tromso in the winter is to view the aurora borealis, more commonly known as the northern lights. It’s the reason why most people visit Tromso in the first place! Although it’s difficult to predict whether you’ll be able to see the northern lights in Tromso, it is a fantastic place to maximize your chances due to its northern latitude and the ability to find clear sky nearby. While you could rent a car and try to see the lights for yourself, it’s probably a bad idea to drive through the frozen tundra in the dark when you’re not experienced with it. Instead, we recommend booking a northern lights chase tour and leaving it to experts to help you find the northern lights. When I went, I did two consecutive big bus chases on two separate nights with Chasing Lights. Yeah, I liked their tours THAT much. If you’re hoping to find the northern lights, I’d highly recommend taking either an organized or private tour with Chasing Lights to anyone visiting Tromso. Check Chasing Lights reviews on TripAdvisor. Tromso is home to one of the strangest-looking churches in the world, which looks like a horizontal cascade of triangles stacked together like dominos. You can see the church from almost anywhere in the city, a beam of white light in the dark of winter. Built in 1965 and designed by architect Jan Inge Hovig, the church has a wide seating area, incredible natural lighting, and an organ. If you’re curious about the Arctic Cathedral, you can take a tour of this historic church and learn more about how it was constructed. The entrance fee is 50 NOK for non-churchgoers, slightly more if there’s a concert or event. One thing that some of the coldest areas of the world can boast is incredible seafood. From king crabs to fresh fish, the seafood options in Tromso are to die for. There are restaurants all along the waterfront that serve local seafood, from king crab to sea bass to prawns and more. You can check reviews of Fiskekompaniet on TripAdvisor or make a reservation here. If you’re tired of trudging through the cold, polar night of Tromso, there are a good number of indoor museums, exhibits, and learning centers to enjoy. My favorite museum, unsurprisingly was the Perspective Museum (perspektivetmuseet). It’s a small photography museum that features rotating and fixed exhibits from Norwegian photographers. The Perspective Museum is a lovely way to escape the cold and enjoy some of the greatest photography in Norway’s history. The icing on the cake? It’s totally, 100% free to enter and peruse the exhibits. There are several other museums in Tromsø, including the Polar Museum, Polaria, the Tromso Museum, and more. Whether you like art, science, history, or culture, there is an indoor museum for you to explore and escape the freezing cold of the outdoors. Maybe all that dog sledding is making your thirsty. Or perhaps you’re craving some bar snacks after burning all of those calories keeping your body warm. If all that cold weather is making you want to heat up with a beer in hand, you can do so while visiting one of Tromso’s most iconic brewhouses. Mack’s Ølhallen is the northernmost brewery in the entire world by latitude, and it’s a Tromso staple. If you like beer at all, Mack’s is a must-see for you. You can grab a drink during opening hours at Mack’s Ølhallen (M-W: 11:00-20:30; Th-F: 11:00-00:30; Sat: 11:00-01:30; Closed Sunday). Alternatively, if you’d rather try a few of the different local brews around the city, you can reserve your spot on the Tromso Beer Safari, which includes a walking tour of Tromso and ten samples of local craft beer. Be sure to book ahead, as the safari sells out quickly! If you’re a fan of sweeping city views from a bird’s eye view, hop on a bus or taxi to Fjellheisen. There, you can hop on a cable car to the top of the mountain, which boasts dazzling landscapes and a small cafe where you can watch the twinkling lights of Tromso down below. The best time to visit Fjellheisen is right before sunset (or during the polar night golden hour), when the sky is still golden and the city begins to light up in the night. At the top, there’s an open air observation deck and an indoor seating area, as well as a small and in-demand restaurant that serves snacks, sandwiches, hot drinks, and larger meals. If you’re lucky, you can snag a table with a window view of the city. To get to Fjellheisen, take bus 62 from the main square area towards Tromsøya and get off at Fjellheisen. You can buy a ticket (31 NOK) beforehand at the Tromso Tourist Information Center, or a more expensive ticket on the bus (50 NOK). Alternatively, you can hail a cab, but it’s a LOT more expensive. The Fjellheisen cable car costs 190 NOK and takes less than five minutes each way. You can check Fjellheisen reviews on TripAdvisor here. If you love the outdoors more than the mountains, take a day to get out and explore the fjords and nearby islands. There are several local tour companies that run fjord tours, which will take you around to various villages and nature areas in the surrounding mountains. Alternatively, you could rent a car and do it on your own. Before booking a tour, I would check reviews on TripAdvisor and, after you’ve chosen where you want to go, you can book fjord tours in Norway here. Want more ideas on seeing these spectacular landscapes? Here are 7 more ways to see the fjords in Norway! Ever wanted to feel like the mushers you see on TV, riding a sled led by a pack of happy huskies? You can try it in Tromso! Join a dog sledding tour to fly through the snow on a sled pulled by as many as 6 dogs. It’s a bit of a workout, and it will almost certainly be freezing cold, but the experience of guiding your own dog sled is out of this world. Dog sledding has been a form of transportation in arctic climate for centuries, and has become more mainstream through large races like the Iditarod in Alaska and movies like Balto. Along with a guide (and a rented set of extra thermal gear), you can learn how the experts ride and steer dog sleds through miles of snow and ice. If riding isn’t your thing, you can also visit a dog farm and pet some huskies and puppies. Dog lovers rejoice – this Arctic activity is one you shouldn’t miss while traveling in Tromso. I highly recommend booking a dog sledding tour in advance, as it’s one of the most popular activities in Tromso and there are limited companies that offer it. You can book a dog sledding tour in Tromso here, or compare reviews for different companies on TripAdvisor. One of the most unique things about Northern Norway is that it’s home to the country’s reindeer-herding Sami population. The Samis are the only indigenous group from Norway, and have lived for generations in the harsh climate of the Arctic, traditionally raising and herding reindeer for a living. Today, most Samis are fully integrated into Norwegian society, but often face discrimination from many non-indigenous people in work and in general. For many years, it was forbidden to speak the Sami language in schools. However, despite the aggression against the Sami people, some families have stayed behind in the cold of the Arctic to continue their traditional reindeer herding business. While in Tromso, you can meet some Sami people, go sledding through the fluffy snow, and hang out with some real-life reindeer. Yes, it’s just as awesome as it sounds – take it from me. I went with Tromsø Lapland and had an excellent experience sledding with and feeding the reindeer, while also learning about the Sami culture and history. Check Tromsø Lapland reviews on TripAdvisor. The entire time I was there, I was giggling with giddy, child-like joy as I watched my childhood Christmas dreams come true. Visiting a Sami farm is a great way to support these indigenous groups whose main livelihood is selling reindeer products and running these tours. It’s important to support them to help keep their traditions alive! If you love to hike but fear the knee-deep snow, snowshoeing could be a compelling alternative for you. On a snowshoeing tour, you’ll breeze through the forested trails of Tromso with a guide to lead the way. For those that don’t know how to snowshoe yet, the guide teach you the basics, including everything you need to know to go on your first snowshoeing adventure. And, of course, since you’ll be outdoors most of the time, most tours provide a set of warm clothes too. You can compare prices and book a snowshoeing tour here. I’d also recommend checking different reviews on TripAdvisor to make sure you’re getting the best price and going with a well-respected tour company. During certain months of the year, some companies in Tromso offer ice fishing excursions. Yeah, you know, those ones where you drop a line through a sheet of ice? Like I mentioned above, there’s all kinds of seafood in the Arctic, and ice fishing is one way to get it. If you’re interested in what it’s like to gather food in the harsh conditions of the Arctic, a day of ice fishing is a unique way to try it. Explore the Arctic offers some well-rated ice fishing tours that other travelers have greatly enjoyed. Activities in Tromso aren’t cheap, so you’ll want to throw in a few free activities around the town to balance things out. One lovely way to spend a short time outside is by bundling up and walking to the Tromso bridge, where the mid day orange light casts beautiful hues over the entirety of the city. Head out as soon as you see the sky turn a hint of yellow, and you should make it there in time for the prime golden hour viewing period. Above is just one of the views you can experience from the bridge, but you can also look out to the other side into the rest of the fjord as well. Whale watching is a huge activity in Tromso because there is so much marine life nearby. There are several organized whale watching tours that offer boat rides to see nearby species in the surrounding waters. Each tour is typically equipped with a marine biologist guide who can teach you about the different species you’re seeing. Onboard, you have the chance of seeing killer and humpback whales native to the region, as well as various species of waterfowl and other marine life. A whale watching tour is a great way to escape the city and take to the seas for a day of wildlife watching. We strongly recommend booking a whale watching tour in advance to secure your place. Note that these tours are weather dependent. You can check and compare reviews on TripAdvisor or book your tour here. Speaking of taking to the seas, there are several other boat rides available to visitors besides whale watching tours. You can see the aurora borealis from a boat, try out a luxury cruise, watch for whales, or embark on a maritime fjords tour. If you love boats more than you like the land, Tromso is a great place to be, with several options including inter-city transportation. For booking a boat tour, you can look into several of the various Tromso boat tour options here. If you’re exhausted from your aurora chasing or dog sledding adventures, Tromso is a charming city where you can meander forever (or at least until you get too cold to feel your feet!). There are a lot of cute areas, restaurants, and coffee shops to explore within walking distance of most hotels in downtown Tromso. Storgata is Tromso’s main walking street and is home to many shops, cafes, tour operators, and restaurants. It’s also a wonderful place to go people-watching or take some interesting street photography in the polar night. If you have some down time, this street is worth a wander – you might just find an interesting hideout to watch the world go by. If you’d like to learn more about the history of the city, you can join a Tromso walking tour that takes you through the highlights of the city, including historic trading areas, viking hangouts, and more. Let’s start with the good news: there are a ton of hotels to choose from in Tromso. The bad news? They’re all really, egregiously expensive, especially for budget-conscious travelers. If you want to compare other hotel options in Tromso, I’d check Booking.com and compare prices with HotelsCombined. You never know where you’re going to find the best deals! What are your favorite things to do in Tromso, Norway? Share your thoughts in the comments!